Giant Paper Clip. 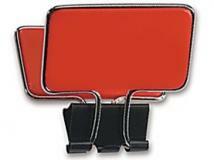 Size : W 3 3/4" x H 1 3/4"
Pressure Sensitive Bulldog Clip. Standard Packaging: Attachments are packaged seperately and bulk packed. 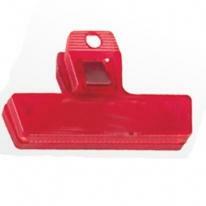 2 3/8" rectangle plastic promo clip. Product Size: 2 1/4" x 2 11/16" Imprint Area: 1 3/4"W x 1 1/4"H Packaging Dimensions: 13"(L) X 8"(W) X 6"(H) Units Per Box: 500 Shipping Weight: 9 lbs. 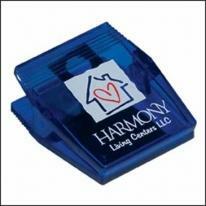 3 1/2" rounded plastic promo clip. Product Size: 3 1/2" x 1 3/4" Imprint Area: 7/8"H x 2"W Packaging Dimensions: 13"(L) X 8"(W) X 6"(H) Units Per Box: 500 Shipping Weight: 9 lbs. Stainless steel paper clip that holds up to 15 sheets of paper. 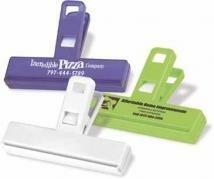 Sturdy clip that will last, ensuring your logo will be seen again and again! Patented item. Holds papers better than standard paper clips. Materials: metal. Product Size: 1-1/8"w x 9/16"h x 1/16"d Imprint Area: Front, 15/16"w x 3/8"h. See diagram., 3 color(s) max. Packaging: 250 per sealed polybag/6300 per case Pack Of: 6300 Weight: 17 lbs. Notes: Due to the nature of this product, some scratching is inevitable during shipment. No credits or returns allowed for product scratched in shipment. 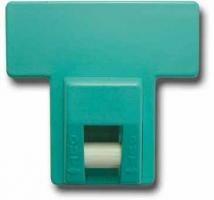 5 3/4" jumbo rounded plastic promo clip. Imprint Area: 1 1/2"H x 3"W Product Size: 5 3/4" x 2 3/4" Packaging Dimensions: 18"(L) X 12"(W) X 7"(H) Units Per Box: 500 Shipping Weight: 22 lbs. Introducing a new product or service? This is the perfect economical advertising vehicle. Choose from multiple shapes and colors. Custom shapes are also available, contact CS for details. Imprint Area: Imprint area based on vinyl shape selected. Product Weight: 3 lbs. per 150, 5 lbs. per 250. Choose headers from multiple shapes and colors Custom shapes are also available, contact CS for details. Imprint Area: Imprint area based on vinyl shape selected. Product Weight: Approx. 3 lbs. per 150, 5 lbs. per 250. 2-1/2" Mini Bag Clip. Price include magnet backing. Product Size: 2-7/16"W x 1-1/2""H Imprint Area: 7/16"H x 2" W Packaging: Layer Packed Packaging Dimensions: 18"(L) X 12"(W) X 7"(H) Units Per Box: 500 Shipping Weight: 11 lbs. 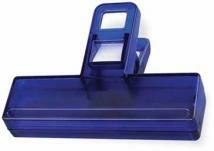 Binder Flip Clip. Approximate Size: 1 3/8" W x 2 1/8" H Imprint Area: 3/4" W x 3/8" H Packaging: Cello Bag, 500 per carton @ 34 lbs. Only Available with Blue and White Rollers. Your message is always in view. Goes up and stays up to provide years of advertising exposure. Sure-Grip roller holds important notes and messages. Pressure sensitive backing sticks to anything. Note: Magnetic backing may be added for an additional $.20 each. Blue rollers available upon request. Material: Impact styrene Size: 2 1/2" x 2 1/2" Imprint Area: 5/8" x 2 1/4" Box Size: 16 x 11 x 11 Shipping: 15 lbs/500 pcs. 4" Bag Clip. Imprint Area: 2" W x 1/2" H Packaging: Cello Bag, 250 per carton @ 29 lbs. 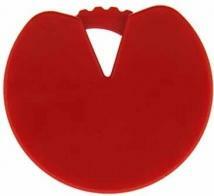 Tightly clips bag, For work or home, Molded hole for wall hanging. 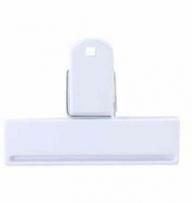 Size : W 3 7/8" x H 2 1/2"
This versatile note clip is designed to hang on fabric covered office panels. Ships with protective cover over back pins. Product Size: 1 3/8"H x 1 1/8"W Imprint Area: 5/8" H x 3/4"W Packaging: Individual Polybag Packaging Dimensions: 18"(L) X 12"(W) X 7"(H) Units Per Box: 500 Shipping Weight: 8 lbs. 3" Magnetic Bag Clip. 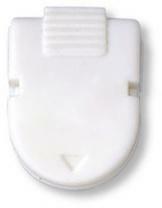 Size : 3" x 2 1/4"
This powerful clip features a powerful magnet. Approximate Dimensions: 1.25" H x 3.44" W x 1.75" D Imprint Area: .5" H x 1.5" W. Weight: .09 lbs. Shown in black, this powerful clip features a powerful magnet. Approximate Dimensions: 1.25" H x 3.44" W x 1.75" D Imprint Area: .5" H x 1.5" W. Weight: .09 lbs. 4" Chip Bag Clip. Molded with up to 100% Recycled Material. Product Size: 4-1/4"W x 2-5/8""H Base Imprint Area: 3/4" Hx 3 3/4" W Grip Imprint Area: 1"H x 3/4"W Packaging: Individual Poly bag Packaging Dimensions: 16"(L) X 12"(W) X 14"(H) Units Per Box: 250 Shipping Weight: 16 lbs. Cinch tight small to medium sized bags with the Mini Cincher. The cinching wheel seals all kinds of bags including bread, produce and chips with a tight seal. Size: 2" Diam. Imprint Area: 1 1/4"w x 3/4"h Carton Weight: 34 lbs/1000 pcs. 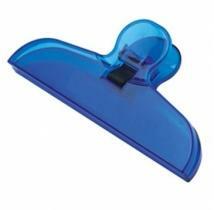 This multi- purpose clip sports a strong, agile spring and has a magnet on one side for hanging. Add your logo as a constant reminder to your clients and customers of your services. The genuine rubber grip allows for a superlative hold, while the vast array of color combinations gives an ease of vision and awareness to your promotional prowess or advertising desire. While small, it provides an ample space for the implementation of your imprint. You can choose a matching offset color, or match the color combination for your personalized imprint. From securing a chip bag, to holding a roster or take-out menu on the fridge this clip will be used tirelessly by the end user. 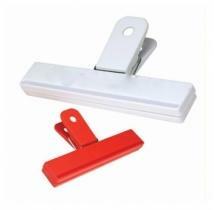 Add'l Color/Location: (250)$0.20, (500)$0.20, (1000)$0.20,(2500)$0.20,(5000)$0.20 Product Dimensions: 1.25" H X 3.44" W X 1.75" D Imprint Area: .5" H X 1.5" W Other decoration methods are available for this item, please call. Weight: .09 lbs. 4" Chip Bag Clip. Union / USA must be specified on each order. Eco Navy Blue, Eco Dark Green, Eco-Tan and Black molded with up to 100% home recycled material. Product Size: 4-1/4"W x 2-5/8""H Base Imprint Area: 3/4"Hx 3 3/4" W Grip Imprint Area: 1"H x 3/4"W Packaging Dimensions: 16"(L) X 12"(W) X 14"(H) Units Per Box: 250 Shipping Weight: 16 lbs. 6" Chip Bag Clip. Union / USA must be specified on each order. Eco Navy Blue, Eco Dark Green, Eco-Tan and Black molded with up to 100% home recycled material. Product Size: 6-1/4"W x 2-5/8""H Base Imprint Area: 3/4"H x 5 3/4"W Grip Imprint Area: 15/16"H x 3/4"W. Packaging: Individual Polybag Packaging Dimensions: 18"(L) X 18"(W) X 16"(H) Units Per Box: 250 Shipping Weight: 23 lbs. 6" Chip Bag Clip. Molded with up to 100% Recycled Material. Product Size: 6-1/4"W x 2-5/8""H Base Imprint Area: 3/4"H x 5 3/4"W Grip Imprint Area: 15/16"H x 3/4"W Packaging: Individual Polybag Packaging Dimensions: 18"(L) X 18"(W) X 16"(H) Units Per Box: 250 Shipping Weight: 23 lbs. 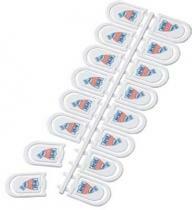 A convenmient pack of 16 ad clips. Fits in a 10 envelope. Great for mailing programs. Imprint Area: 3/4"W x 1/2"H on each clip Product Size: 8 1/2" x 3 3/8" Packaging Dimensions: 15"(L) X 11"(W) X 6"(H) Units Per Box: 250 Shipping Weight: 15 lbs. 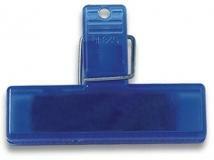 Small cubicle clip attaches to fabric office dividers or corkboards with durable steel pins. Dimensions: 1 1/8" H x 7/8" W x 5/8" D Imprint Area: 1/2" H x 5/8" W Packaging: Individually poly-bagged Shipping Info: Box Dimensions: 16" L x 12" W x 12" H Shipping Weight: 1.40 lbs / 100 pcs. 2000 pcs / box. Small 2 1/2" sizes are ideal for neatly holding coupons and small bags together. Options: Magnetic backing: add $.08 each. Dimensions: 2 9/16" H x 2 1/2" W x 1 1/8" D Imprint Area: Front or Back: 5/8" H x 2" W Packaging: Individually poly-bagged Shipping Info: Box Dimensions: 18" L x 18" W x 15" H Shipping Weight: 3.39 lbs / 100 pcs 1000 pcs / box. Constructed from magnetic material with durable vinyl coating. Multiple magnetic header shapes and colors. Magnet is perforated for continued use after calendar year had ended. Imprint Area: Imprint area based on magnetic shape selected. Product Weight: Approx. 4 lbs. per 150. Constructed from magnetic material with durable vinyl coating. Multiple magnetic header shapes and colors. Magnet is perforated for continued use after calendar year had ended. Imprint Area: Imprint area based on magnetic shape selected. Product Weight: 4 lbs. Per 150. Constructed from magnetic material with durable vinyl coating. Multiple magnetic header shapes and colors Magnet is perforated for continued use after calendar year had ended. Imprint Area: Imprint area based on magnetic shape selected. Product Weight: Approx. 4 lbs. per 150. Small 2" size is ideal for neatly holding coupons together. Options: Magnetic backing, add $.05 each. Dimensions: 1 1/2" H x 2 1/4" W x 3/4" D Imprint Area: Front or Back: 7/16" H x 1 15/16" W Packaging: Bulk. For individual poly-bagging, add $.08 each. Shipping Info: Box Dimensions: 18" L x 16" W x 12" H Shipping Weight: 1.12 lbs / 100 pcs 2000 pcs / box. Just the right size to keep papers organized together or tightly seal small food bags. Features a patented design with sturdy gripper teeth and a durable internal metal spring. Options: Magnetic backing: add $.08 each. Dimensions: 2 1/2" H x 4" W x 1 1/8" D Imprint Area: Front or Back: 1/2" H x 3 3/8" W Packaging: Individually poly-bagged Shipping Info: Box Dimensions: 21" L x 19" W x 18" H Shipping Weight: 3.95 lbs / 100 pcs 800 pcs / box. 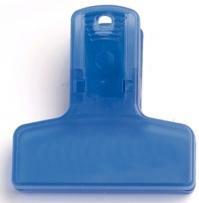 Mini Chip Clip White Imprint recommended for translucent items. Individually Poly bagged. Size: 3 7/8" x 2 3/8"H x 7/8 D Max Imprint Area: 2 1/2 "W X 1/2"H WT_100: 6 LBS. Paper-Proof: $10. (Required on all labels). 20:10. 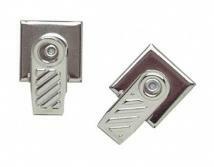 Features ten imprinted clips (only one set-up charge). Fits into a #10 envelope. Easily twist-off paper clips from mailer. Dimensions: 1 1/2" H x 1 3/8" W (per clip) Imprint Area: Front or Back: 1/4" H x 7/8" W (per clip) Packaging: Individually poly-bagged. Shipping Info: Box Dimensions: 18" L x 16" W x 12" H Shipping Weight: 6.00 lbs / 100 pcs 500 pcs / box. Popular 4" blade length. A powerful sealer, a necessity in every kitchen. The big-bite, 4" blade handles all sealing needs. Non-rust construction, can be used indoors or out. Note: Magnetic backing may be added for an additional $.20 each. Material: Styrene Made In: China Size: 2 1/2" x 4" Imprint Area: 3/8" x 3 5/8" Box Size: 22 x 13 x 13 Shipping: 21 lbs/400 pcs. Super Clip. Size : Clip: 6" wide. Standard Imprint Area : 3/8" h x 4 1/2" w. Packaging : Bulk. Shipping Weight : 100 / 13 lbs. Clip large bags tightly, For work or home, Larger, stronger clip. Size : W 6" x H 3 5/16"
Giant Paper Clip. Oversized clip. Actual Size: 4-1/4"h x 3-1/8"w Imprint Area: 1"h x 2-1/2"w Packaging: Individually polybagged Shipping Weight: 10lbs per 250pcs. 6" Bone Shape Bag Clip. Great for pet food promotions. Product Size: 6-3/8"W x 3"H Imprint Area: 3/4"H x 4 3/8"W Packaging: Individual Polybag Packaging Dimensions: 18"(L) X 18"(W) X 16"(H) Units Per Box: 250 Shipping Weight: 23 lbs. Single-use soda, juice and water bottles are reclaimed from local recycling centers. The materials is cleaned and recrystalized, so we can recycle it into useful promotional products. 4" Chip Bag Clip. 100% Pos-Consumer Reccyled PET 1. Product Size: 4-1/4" x 2-5/8"" Base Imprint Area: 3/4" Hx 3 3/4" W Grip Imprint Area: 7/8"H x 5/8"W Packaging: Individual Polybag Packaging Dimensions: 16"(L) X 12"(W) X 14"(H) Units Per Box: 250 Shipping Weight: 19 lbs. A kitchen necessity. A powerful clip packed into a compact size. Features tough, non-rust, plastic spring. Perfect for sealing snacks and cereals. Material: Impact Styrene Made In: China Size: 2 1/4" x 3" Imprint Area: 7/16" x 2 1/2" Box Size: 19 x 11 x 13 Shipping: 15 lbs/500 pcs. Features ten imprinted clips (only one set-up charge). Fits into a #10 envelope. Easily twist-off paper clips from mailer. Dimensions: Mailer: 3 1/2" H x 8 5/8" W x 1 1/16"D 1 1/2" H x 1 1/2" W (per clip). Imprint Area: Front or Back: 5/8" H x 5/8" W (per clip) Packaging: Individually poly-bagged Shipping Info: Box Dimensions: 18" L x 16" W x 12" H Shipping Weight: 5.62 lbs / 100 pcs 500 pcs / box. 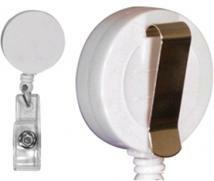 Features ten imprinted clips (only one set-up charge). Fits into a #10 envelope. Easily twist-off paper clips from mailer. Dimensions: Mailer: 3 1/2" H x 8 5/8" W x 1 1/16"D 1 1/2" Diameter (per clip). Imprint Area: Front or Back: 3/4" Diameter (per clip) Packaging: Individually poly-bagged Shipping Info: Box Dimensions: 18" L x 16" W x 12" H Shipping Weight: 4.34 lbs / 100 pcs 500 pcs / box. Spring action clip. Seals items tightly. 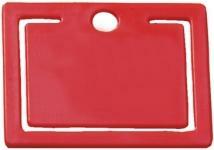 Size: 2-1/2"h x 3-7/8"w Imprint Area: 1/2"h x 2-3/4"w either side. Packaging: Bulk Shipping Weight: 30 Shipping Quantity: 500. Mini bag clip trans. Spring action clip. Size: 2-1/2"h x 3-7/8"w. Imprint Area: 1/2"h x 2-3/4"w Each Side. Packaging: Bulk Shipping Weight: 30 Shipping Quantity: 500. This versatile note clip has a hundred uses around the home or office. It?s handy, so your advertising message is seen and appreciated everyday. Hang hole on back fits most push-pins. Product Size: 2 3/8" x 2 1/2" Imprint Area: 1 5/8"W x 1 5/8"H on clip Packaging: Individual Polybag Packaging Dimensions: 15"(L) X 11"(W) X 12"(H) Units Per Box: 250 Shipping Weight: 19 lbs. Great size for keeping snack bags freshly sealed or keeping documents grouped. Features a patented design with sturdy gripper teeth and a durable internal metal spring. Options: Magnetic backing, add $.12 each. Dimensions: 2 1/2" H x 6" W x 1 1/2" D Imprint Area: Front or Back: 1/2" H x 4 3/8" W Packaging: Individually poly-bagged Shipping Info: Box Dimensions: 21" L x 19" W x 18" H Shipping Weight: 4.95 lbs / 100 pcs 550 pcs / box. Strong magnet for super holding power. Hundreds of uses. Real rubber handles for a great feel. New, eye-catching neon color with sparkling glitter. Approximate Dimensions: 1.25" H x 3.44" W x 1.75" D Imprint Area: .5" H x 1.5" W. Add'l Color: 250($0.20),5,000($0.16) Weight: .09 lbs. 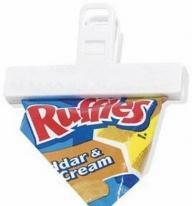 A plastic bag clip to seal opened bags of chips or others snacks. Size: 3 7/8"w x 2 1/2"h Imprint Area: 3 1/8"w x 7/16"h Carton Size: 27" height x 17" width x 13" length Carton Weight: 29 lbs/500 pcs. A plastic eyeglass and pen holder that clips on to most sun visors, pockets, bags or just about anything. A great summer / sunglass item. Size: 1 1/8"w x 2 3/4"h Imprint Area: 5/8"w x 1 3/8"h Carton Size: 24" height x 11" width x 14" length Carton Weight: 25 lbs/ 500 pcs. United States Patent 6,533,414 B2 Hang & Secure Your Valuables Secures More Than Just 10 Items Also Holds Eyewear, Pens, And More Attaches Practically Anywhere! Size : 3" W x 1" H. Imprint Area : 1-3/4" wide x 5/8" high. Shipping : 250 pcs / 5 lbs. Additional Color : $0.25. Reorder Setup : $25. PMS Matching : $40. We use a 4 color process to put your imprint on a useful office product. Great trade show giveaway! Material: Metal Size: 1"w x 2"h x 1/8"d Imprint Size: Vinyl Panel, 7/8" dia., 4 color(s) max. Packaging: Bulk Pack Of: 1000 Weight: 21 lbs. 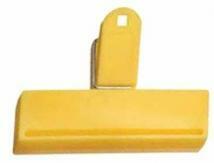 Classic Bag Clip Features a Large Grooved Area for a Secure Hold. A Generous Grip Area with Hook Through Hole. Please note: one color imprint only. Material: Plastic Product Dimensions: 6 3/16"w x 3 1/2"h Imprint Dimensions: 4 1/4"W x 5/8"H Packaging: Polybag Wt./100: 11 lbs. 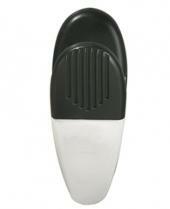 Extends up to 35" Stationery slide-on clip on back Swivel vinyl snap on strap Lightweight. Size: 1-1/4" Diameter Imprint Area: 1" Diameter Packaging: Individually bagged. Weight: Approx. 30 lbs./M. 6" Bag Clip. Imprint Area: 3 1/4" W x 1/2" H Packaging: Cello Bag, 250 per carton @ 29 lbs. Imprint on 2 locations Spring action clip Multi-purpose item Tiger teeth edges Magnet available. Size: 3-7/8" W x 2-3/4" H Imprint Area: Top Circle: 1-1/2" D Bottom Area: 3-1/2" W x 1/2" H Packaging: Bulk packed. Weight: Approx. 65 lbs./M. You'll find many uses for this all-purpose clip. Materials: ABS plastic. Size: 4"w x 1"h x 2-1/2"d Imprint Area : Front, 3-1/4"w x 1/2"h, 1 color(s) max. Packaging: Poly-bagged Pack Of: 250 Weight: 17 lbs. The Paper Clip Set holds 12 small and 1 large paperclip. Just twist them off to use. It fits nicely in a 10 envelope and is perfect for direct mail promotions. All clips are printed at the same time and included with one setup charge. Now available with our new BioPro Biodegradable plastic. Size: 9" x 3 1/2" Imprint: Small Clips: 1/2" x 7/8" Large Clip: 5/8" x 1 3/8" Packaging: Bulk Weight: 7 lbs. (100 pcs.). Spring Loaded Hinge Magnet On Back Side. Approximate Size: 2 3/8" Diameter Imprint Area: 1 1/2" Diameter Packaging: Cello Bag, 250 per carton @ 29 lbs. 6" Magnetic Bag Clip. Imprint Area: 5 1/2" x 11/16" Max. Imprint Colors: 2 Item Size: 6" x 3 1/4" Packaging: Polybagged 150 = 15 lbs. This powerful clip features a powerful magnet. 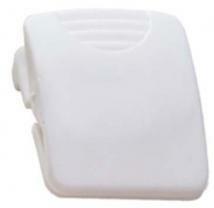 Approximate Dimensions: 1.25" H x 3.44" W x 1.75" D Imprint Area: 0.5" H x 1.5" W Weight: 0.1 lbs. 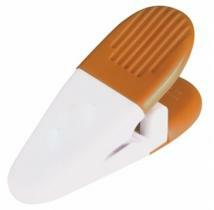 Reliable memo clip features a heavy-duty spring loaded hinge, magnet on back and rubberized grip. Material: Polystyrene Product Dimensions: 3 3/8" H x 1 1/4" W x 1 3/4" D Imprint Area: 1 1/4" W x 1/2" H Packaging: 200 Per Box Shipping Weight: 21 lbs. 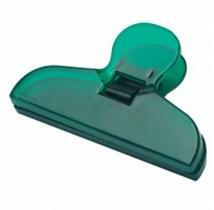 Translucent Magnetic Memo Clip. 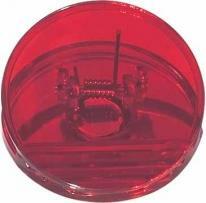 Round magnet on the back sticks to metal surfaces. Spring loaded clip holds your paper with ease. Individually polybagged. Size: 3 1/4" W x 1 1/4" H. Max Imprint Area: 3/4" W x 1" H. WT_100: 19 LBS. Paper-Proof: $10. (Required on all labels). Holds approximately 75 sheets of paper Same ad copy in one color on both sides of one tab. Imprint Area: 1-1/4"w x 5/8"h front of any two tabs 1-1/4"w x 5/8"h front and back of same tab Packaging: Polybag Size : 1-1/2"w x 1-3/4"h total 1-1/2"w x 3/4"h clip only Product Specs Size : 1-1/2"w x 3/4"h clip only Size : 1-1/2"w x 1-3/4"h total Imprint Method : Pad Printed Imprint Area : 1-1/4"w x 5/8"h front and back of same tab Optional Imprint Area : 1-1/4"w x 5/8"h front of any two tabs Shipping info: 500 pieces per carton, 11.00 lbs per carton, carton size 6.00" x 12.00" x 10.00"